Thanks to Dr. Atif Ahmed, Children's Mercy Hospitals and Clinics, Kansas, Missouri (USA) for contributing this case and much of the discussion. To contribute a Case of the Week, follow the guidelines on our Case of the Week page. (1) We added a feature to the Conferences page to quickly see the new postings, in reverse date posted. This feature was already present on the Jobs and Fellowship pages. (2) We are redesigning our textbook pages so they load faster, by pulling the images directly from the server, instead of making them part of our file. Let us know if you notice any problems. (3) We continue to update our 5000+ topics on a regular basis. If you are interested in reviewing a topic, please email us your CV and let us know what chapter and topics you are interested in reviewing. (4) You can receive a special saving pass which gives up to 25% off one item at any Macy's store or online on October 16, 2010, just for donating $5.00 or more to The Detroit College Promise, the scholarship program we sponsor. 100% of your donation is used for scholarships for our students. Of course, your donation is also tax deductible as allowed by law. Donate now by clicking here. Your savings pass will be mailed to you separately. A 5 month old boy presented with respiratory difficulty and stridor. A CT scan revealed a retropharyngeal mass. Excisional biopsy was performed and histologic sections are shown below (H&E, synaptophysin and NB-84). The tumor cells were immunoreactive for CD56, chromogranin and focally for neuron-specific enolase, and were negative for cytokeratin and CD45 (images not shown). Neuroblastoma is the most common extracerebral solid tumor in the pediatric population, accounting for 30% of tumors in infants (J Laryngol Otol 1985;99;209). It presents most commonly in the abdomen, particularly in the adrenal medulla, and head and neck presentation is rare with cervical disease in only 1% of pediatric cases. In the retropharyngeal region, there have been <20 reported cases of neuroblastoma in the English literature (J Pediatr Surg 1982;17;180). The clinical differential diagnosis of a non-infectious infantile retropharyngeal mass includes retropharyngeal fistula, pharyngeal dermoid, lymphatic malformation and neurofibroma. Primary cervical tumors are typically diagnosed at a younger age than tumors outside of the head and neck, with 50% found in infants less than one year of age, likely due to the comparably small space available for tumor growth. Aerodigestive symptoms of stridor, stertor (a heavy snoring inspiratory sound) or dysphagia are common. Infants may also develop ipsilateral ptosis if the superior cervical ganglion is involved, and heterochromia iridis (eyes of different color), since the sympathetic nervous system is involved in the development of eye color. Workup includes a thorough history and physical exam, a chest radiograph and soft tissue neck CT. If dysphagia is present, a barium swallow should be obtained. Urinary concentrations of the catecholamine metabolites 3-methoxy-4-hydroxy mandelic acid and homovanillic acid should also be obtained. These levels are elevated in 90-95% of children with neuroblastoma, although there is a high false negative rate with mass screenings (Med Pediatr Oncol 1987;15;14). Despite elevated catecholamines, this tumor rarely causes hypertension. The release of catecholamines illustrates that neuroblastomas arise from neural crest cells in the sympathetic nervous system. Grossly, neuroblastomas are well circumscribed, tan masses which may have areas of coagulative necrosis. 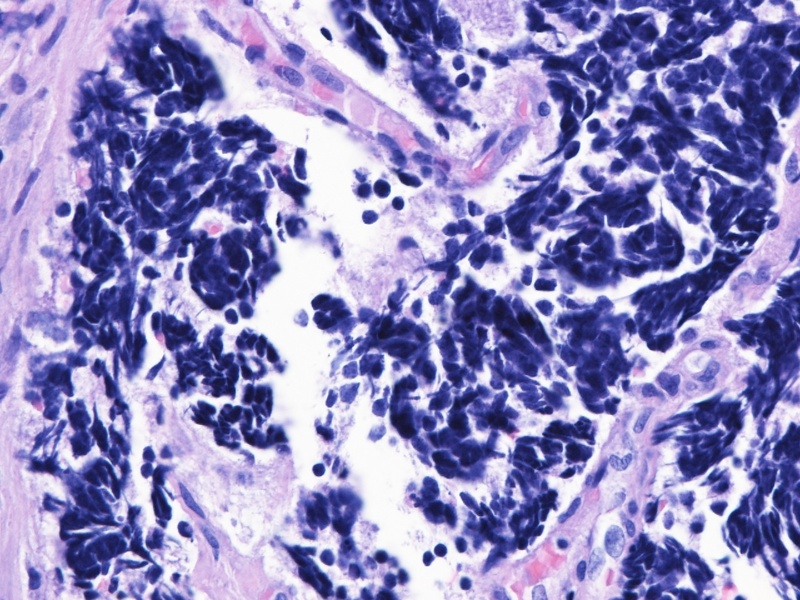 Histologically, these tumors are described as small blue cell tumors with hyperchromatic nuclei and scant perinuclear cytoplasm, which may be arranged in rosettes or cords in a background of fibrillar tissue. The histologic differential diagnosis includes other small round blue cell tumors such as lymphoma, Ewing�s sarcoma and rhabdomyosarcoma. Neuroblastomas are immunoreactive for neuron-specific enolase, synaptophysin, NB-84 (more sensitive but less specific than synaptophysin) and other neuroendocrine markers (Arch Otolaryngol Head Neck Surg 2000;126;1150). 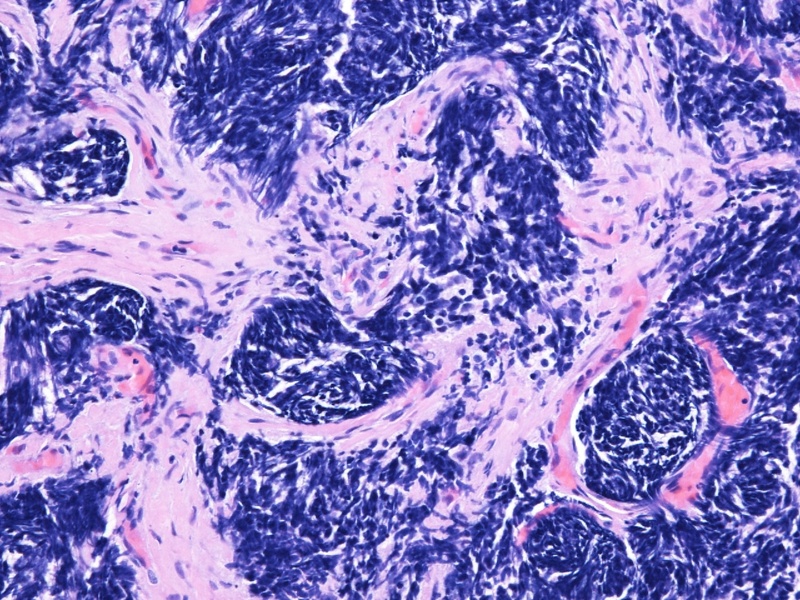 Surgeons should handle suspected neuroblastoma cases with care to prevent crush artifact. 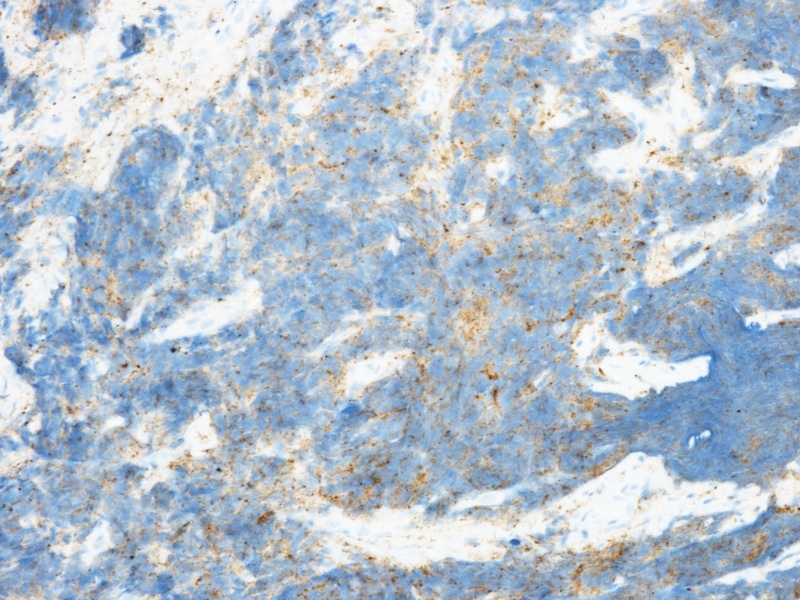 If present, as in this case, the histology may be obscured, requiring extensive immunohistochemistry testing for diagnosis. Genetic analysis by fluorescence in situ hybridization has proven useful. N-myc gene amplification is associated with more rapid tumor progression, even in low stage cases (Clin Chem 1989;35(7 Suppl):B38). Loss of heterozygosity of the short arm of chromosome 1 (1p), which correlates with N-myc amplification, is also a marker of aggressiveness. 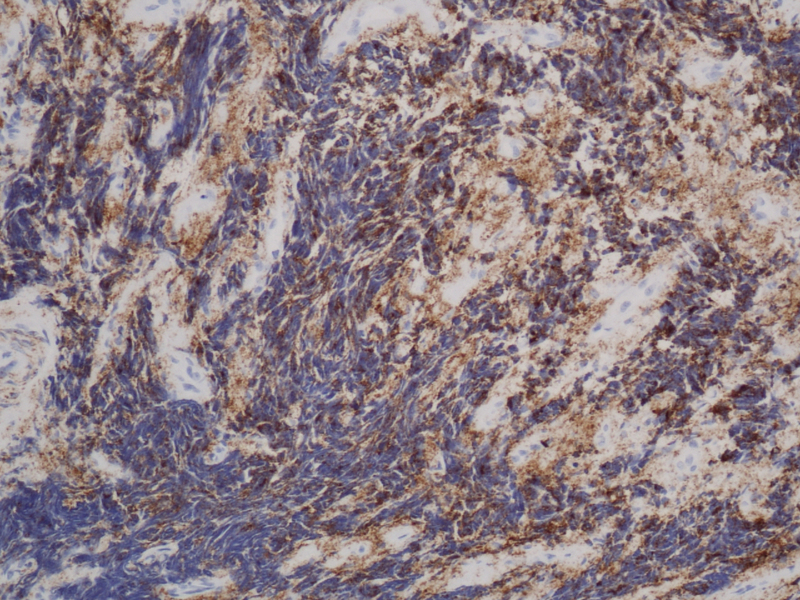 The poor prognosis associated with these markers may be due to their association with increased vascularity, and may lead to the use of antiangiogenic chemotherapeutic agents to prevent disease recurrence (Appl Immunohistochem Mol Morphol 2007;15:181). Management of retropharyngeal neuroblastoma depends largely on clinical stage. Surgical excision is indicated for locally confined diease, either via an intraoral approach, if the tumor is medial to the great vessels, or through a transcervical approach. While the latter method provides a wider surgical field, it also risks damage to the ipsilateral glossopharygeal and vagus nerves and may harm sympathetic cervical nerves, causing new onset of ptosis. A radical neck dissection is not required, although enlarged surrounding lymph nodes should be removed (Arch Dis Child 1982;57;438). 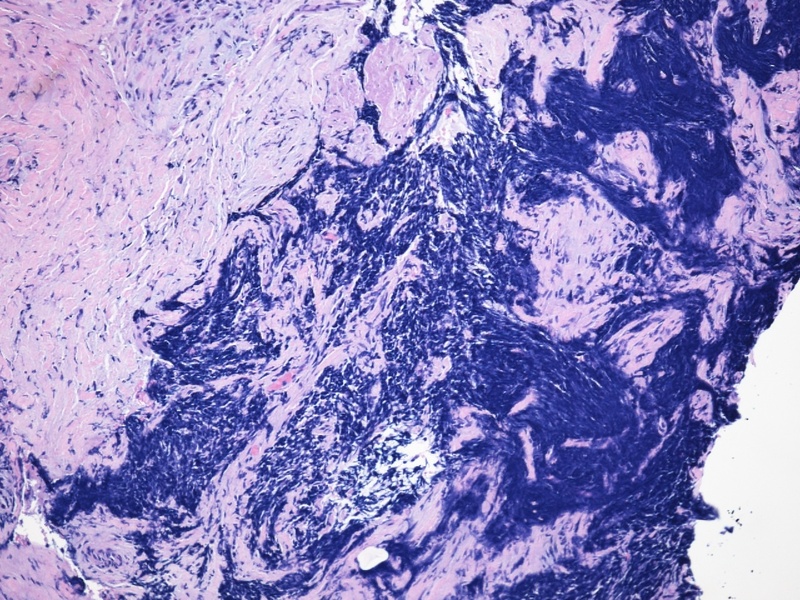 Intermediate and high stage tumors that have residual disease may require chemotherapy, although neuroblastoma has the unique propensity to regress after partial excision. Thus, monitoring may be acceptable after subtotal resection, particularly in children under age one year, who have a more favorable prognosis. Overall, 74-82% of infants under age one year survive, compared with 10% survival in patients over age two years (Cancer 1971;27;374). Observation for recurrence may be aided by analyzing urine for catecholamine degradation product levels. Radiotherapy is not currently recommended for retropharyngeal neuroblastoma due to concerns about its effect on spinal growth, its long and short term toxicity and its potential for inducing a second primary tumor in the head and neck.